Panorama Tower was engineered to both ensure occupant comfort and to deliver the maximum level of saleable area to ownership. To complete the structure as required, the structural scheme had to accommodate, with transfers, architectural elements including parking levels, a hotel, office space, and residential levels. At the foundation, 36-inch (914-millimeter) diameter piles were implemented, with a minimum tip elevation of 125 feet (38 meters) below grade, and a maximum capacity of 2,740 Kips (12,188 kilonewtons) in compression. The design used two types of tension piles to optimize the design and utilization of the steel. One type supports 1,050 Kips (4,670 kilonewtons) in tension, and the other, 500 Kips (2,224 kilonewtons). 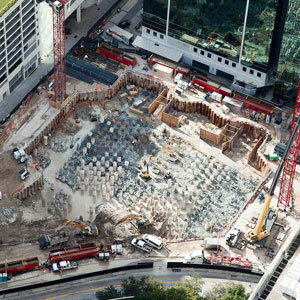 The foundation design accounts for hurricane wind loads, while the piles are in a layout designed to minimize settlement. Panorama Tower contains a number of complex concrete elements, including six outrigger girders that are one to two stories in height and reinforced with steel plates, connecting the building core with the outrigger megacolumns. Effective collaboration with the architect and shell contractor allowed for intelligent detailing of more than 10 transfer structures, in addition to the six main outriggers and belt trusses. Additionally, the post-tensioned slabs were optimized for maximum efficiency and reduced to minimum depths of 8 inches (203 millimeters) at the podium and 7.5 inches (191 millimeters) at the tower. The steel plates are typically one story in height, with the exception of the plate between levels 17 and 19, which measures two stories in height and incorporates an intricate detail that uses welded connections.